Left Focus: The Abbott Agenda: Is this what Australians voted for? The Abbott Agenda: Is this what Australians voted for? 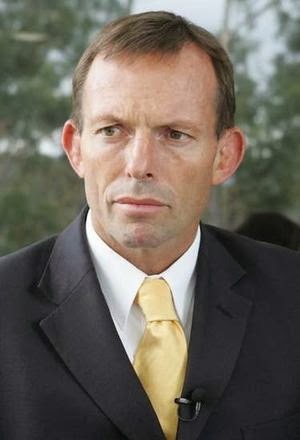 Above: Tony Abbott playing "Robin Hood in Reverse"
During the 2013 Federal Election Campaign the Liberal camp attempted to play down Labor suggestions of their ‘cutting to the bone’ on attaining government as ‘fear mongering’. But now – with the Abbott government ‘settling in’ it is becoming clear that austerity will follow – even amidst the most gratuitous middle class and corporate welfare. The Abbott government is playing at ‘Robin Hood in Reverse’ – as a number of observations demonstrate. On November 6th ‘The Age’ and the ‘Herald-Sun’ reported that the Abbott Coalition government was going ahead in its restoration of Superannuation tax concessions for those very few (16,000) who make over $100,000 a year from superannuation investments. The cost of this largesse is no less that $300 million in public money – which will largely be made up from attacks on vulnerable Australians, and 3.6 million of the most lowly paid workers. This includes removal of superannuation concessions for those low-paid workers. The Liberals say this is necessary to pay for shelving the Minerals Resource Rent Tax. But they have prioritised tax concessions for the wealthy over tax concessions for the working poor. Other Liberal measures include the restoration of Private Health Insurance Rebates for those on high incomes – with the removal of Labor’s means test. According to their own figures, restoring the Private Health Insurance rebate for wealthy Australians will cost the Liberal government over $3.8 billion. Even given the Liberals’ preferred framework of private health insurance rebates, an alternative could have been higher subsidies for those on lower incomes, and the removal of penalties for welfare dependent and low income Australians whose private health insurance lapses. But again: the Liberals are in the business of taken from the poor and giving to the wealthy. Further, the Liberals have not committed to the full implementation of the Gonski education reforms, with no commitment to the final two years of the program. (ie: when most of the funding was to be concentrated; hence depriving state schools of billions in funding) Labor’s ‘schoolkids bonus’ – which delivered $820 per child a year for families - will also be cut. The result is that the government must be seen as accepting (or promoting!) the trend towards a tiered education system: where an under-resourced state system is increasingly seen as the inferior option. The ongoing leakage of students to the private system will only exacerbate this tendency – with its consequences for the life chances of opportunities of hundreds of thousands of disadvantaged students. This will cost the country over the long run. Importantly, the government is also moving to save $4.5 billion by slashing our foreign aid budget – with a callous disregard for the most desperately vulnerable people on the planet. In the same spirit the Liberals are poised to slash the country’s humanitarian refugee intake by 6,250 places a year to 13,750. On the environmental front, the Coalition’s ‘Direct Action ‘ emissions reduction policy will ‘rob Peter to pay Paul’ – in the sense that money returned to taxpayers from dropping the Carbon Tax will be taken back by the government through other taxes to pay for the new policy. Rebates for micro-renewables are to be cut; as well as billions in funding for the Clean Energy Finance Corporation, and for other renewables research. Specifically the program – including investment in ‘soil carbon’ and ‘positive incentives’ (ie: subsidies - but with no guarantees!) for business is estimated by the government to be costing tax payers just under $2.9 billion. But independent research shows the program will need a minimum $4 billion extra to meet its (already modest) targets. Labor must pressure the government not only to adopt a cap on pollution via an Emissions Trading Scheme (ETS), but to pursue more genuine and robust ‘direct action’ – funded progressively. The abolition of the Clean Energy Finance Corporation is short-sighted; and generous feed in tariffs for energy, and public investment in renewables research and infrastructure could make a real difference. The Carbon Tax was good policy – producing results on emissions reduction. But it has been rendered politically impossible given Gillard’s 2010 pre-election promises; and Abbott’s ruthless disinformation campaign. Meanwhile Abbott’s Paid Parental Leave scheme aims to provide six months leave at full pay for some of the country’s richest women: those on $150,000 a year. Though amendments by the Greens could see a ceiling for women on $100,000/year – with the consequence of a $50,000 maximum payment over six months. ‘The Australian’ argues that “the new flagship paid parental leave scheme will cost $5.5 billion a year” – as opposed to $6.1 billion as originally intended. A fairer cap on the scheme would be $35,000 – or six months full pay for working women up to $70,000/year. (close to the average wage) Perhaps Labor should support such a policy. Here, the Coalition’s levy on big business is welcome. But it could be far better spent: on national aged care insurance for instance. And it makes little sense in the context of larger Company Tax cuts (another 1.5%; costing about $5 billion ‘over the forward estimates’), further entrenching a culture of corporate welfare. While Abbott believes this will create some private sector jobs, it will undeniably cost public sector jobs. For instance, big Centrelink cuts will cut deep into the quality of customer service – with the return of ridiculous waiting periods of over an hour for clients seeking assistance. How can Abbott ‘come down hard’ on poverty-stricken job-seekers at the same time as ‘taking the rug from under them’ in terms of support? Interestingly also, Australian Company Tax is significantly below US levels, and the forsaken revenue from Company Tax cuts must be made up elsewhere – as otherwise services, welfare and infrastructure cannot be paid for. Insofar as corporations benefit from services and infrastructure – the consequence is ‘corporate welfare’ – in the sense that ordinary taxpayers are subsidising corporations. That is – they are making up for corporations’ proper share of the tax burden. At the same time Abbott is on the verge of withdrawing government support for the car industry – with a projected $500 million in cuts. Estimates hold that this move could see unemployment rise by 1.5%, costing the economy $21.5bn a year. And while car industry support may also be seen by some as another example of ‘corporate welfare’ itself, it is a special case – because of the multiplier effect with regards jobs, and the fact that core jobs are relatively high-wage compared with manufacturing elsewhere. The skills and capacities are also of strategic value for the Australian nation. Meanwhile, the Liberals have signalled their intention to significantly increase Defence expenditure: at a time when they are claiming a ‘budget emergency’ as a rationale for wide-ranging austerity. And yet previously announced Gillard government subsidies for Aged Care workers will be withdrawn in an attempt to undercut unions: with the probable consequence that the sector will lose more skilled workers; and aged care residents will suffer the consequence. Abbott has declared that: "the carbon tax will go, but no-one's personal tax will increase and no-one's fortnightly pension or benefit will reduce. It is beginning to look unlikely, however, that welfare will remain untouched. There is a uncomfortable reality that both the Liberals and Labor were reluctant to talk about during the election campaign. When fully implemented, Disability Care Australia will peak with a price-tag over $22 billion, with roughly half coming from the Federal Government. What is more, an ageing population and a growing population must mean additional expenses when it comes to health, aged care, and infrastructure. The time has come for Abbott and other self-avowed Christians in the Coalition to search their consciences. The time has come to confront the fact that given the developing social and economic pressures, ‘small government’ at all costs is neither compassionate, rational or just. And your comments relating to impact of the decline of the manufacturing sector also to go to spatial regional impacts. What a devestating socio-economic impact for South Australia for instance.